Andover’s Paige Webster hit a backhand against Barnstable during a state semifinal. Berler turned in a 20-0 regular season with partner Michaela Cornwall. Individually, they reached the South Sectional final, where they lost to teammates and fellow All-Scholastics Gabrielle Riley and Katie Tynan. The honor student is also a competitive dancer. Block has formed an unbeatable duo with Sarah Yang that still has two years left. They went 18-0 during the regular season, and won the North Sectional and state doubles titles for the second straight year. Their efforts helped C-C to an 18-1 record and the Division 2 state title. Cancio helped lead Concord-Carlisle to the state title this year with a 17-1 record. She was a North Sectional finalist in the individual tournament as well. A high honor student, she plays USTA tournaments year-round and will attend Williams. Cornwall went undefeated in the regular season with partner Taya Berlor, helping Barnstable win the South Sectional title. Individually, the high honor student and Berler got to the South Sectional final before falling to Barnstable teammates Gabrielle Riley and Katie Tynan. Davis captured her third straight individual state title with another undefeated season. The National Honor Society student competes nationally in USTA events year-round, and has committed to play at Wake Forest. The Cape Ann League player of the year, Downey went 14-0 in the regular season and reached the state individual semifinals. A high honors student who has played first singles three straight years, Downey hopes to continue playing in college. Only a freshman, Essi turned in a solid season, earning DCL All-Star honors and helping lead Wayland into the state tournament. Individually, she reached the quarterfinals of the sectional tournament. A high honor student she plays year-round tennis in USTA events. Lesnick opened plenty of eyes this spring,going 12-1 and earning Bay State League MVP honors. She reached the South Sectional final in the individual tournament. She is an honor student and competes year-round in club tennis. Mukund teamed with Paige Webster to lead Andover to the MVC, North Sectional, and Division 1 state championship. A high honor student, she enjoys volunteering and competes for the Willows club tennis team. Potter turned in a 13-1 regular season, helping Martha’s Vineyard squeak into the state tournament. Individually, she reached the South Sectional semifinals before falling to eventual state champ Emma Davis. She is ranked near the top of her class academically. 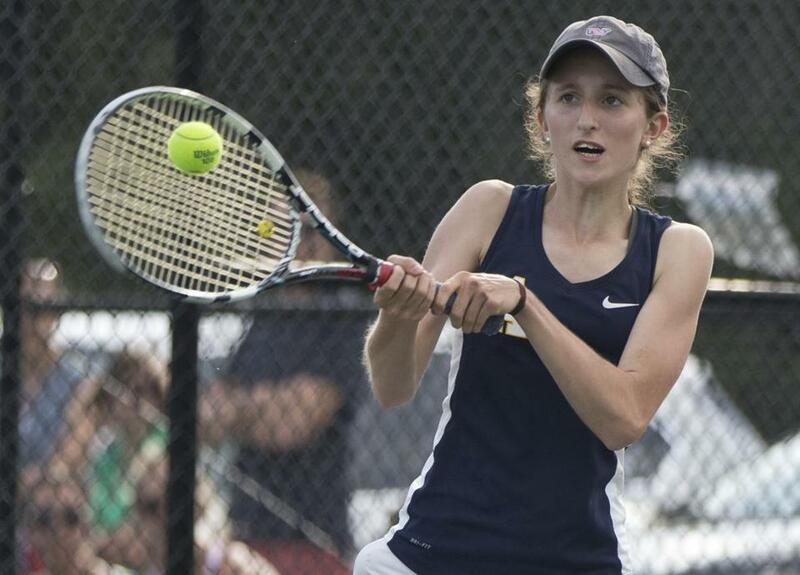 Prinos helped lead Foxboro to the Division 2 South Sectional title this season from her top singles spot and also reached the South semifinals of the individual tournament. A high honors student, she also runs cross-country in the fall. Riley closed out her doubles career with a 21-0 record with Katie Tynan and a South Sectional individual title, and helped Barnstable to the South team title for the third straight year. She will attend Roger Williams. Tynan helped lead Barnstable to a sectional title with teammate Gabrielle Ryan. The duo sported a 21-0 record in team matches, while also capturing the South Sectional individual title. A high honor student, she also competes in USTA events. Webster was one half of the top doubles duo for the Division 1 state champions. Webster and her partner Pooja Mukund helped Andover win the MVC for the third straight year, compiling a 44-7 record over that time. Individually, they were North Sectional finalists. Wiggins turned in a remarkable 16-0 regular season at first singles that earned her Middlesex League All-Star honors for the second straight season. She was the North Sectional champion and reached the state semifinals before falling to eventual champ Emma Davis. Teaming up with Meredith Block, the dynamic duo won everything they could for a second straight year. After an 18-0 regular season, they followed that up by winning the state doubles tournament while also helping C-C win the Division 2 state title. In just his second season Hibino led Andover to a 23-0 season and the Division 1 state title, to go along with the North sectional and Merrimack Valley conference crowns. The Andover alum and Michigan graduate also coaches JV basketball at Andover. Lightbody guided his team to a 15-1 regular season. In the tournament his team took off, capturing the Division 2 South Sectional title with a 3-2 win over Nauset before falling to eventual state champ Concord-Carlisle in the state semifinals. The reigning Division 3 wrestling coach of the year, Stone had an outstanding spring, leading the Pioneers to a 21-0 record and the CAL, North Sectional, and Division 3 state titles. In 34 seasons at Lynnfield ,he sports a 526-82 record. Bay State — Braintree: Kelly Hrebenak. Brookline: Rachel Hechinger, Mei Kasif. Framingham: Sarah Kalmanvich, Maddie Nasch, Melissa Parrish, Rachel Wagner. Milton: Olivia Johnson. Natick: Eliza Kruzcynski. Needham: Jodi Katz, Kelly Sullivan, Lauren Yerardi. Newton North: Taylor Lord. Walpole: Alyssa Rosen. Wellesley: Cecelia Lesnick, Katherine Lucas, Lisa Peters, Olivia Stein. Big Three — Brockton: Jane Dao, Michelle Fleuriot. Durfee: Courtney Bailey, Vanessa Dacosta, Beatriz Furtado, Allyshia Greaves, Megan Rockett. New Bedford: Kelsey Santos. Cape Ann — Lynnfield: Logan Colby-Nunziato, Sloan Colby-Nunziato, Sarah Mezini, Kelley Nevils, Olivia Skelley, Danielle Soder. Masconomet: Rebecca Costa, Brooke Hunzinker, Erin Johnson. Pentucket: Nicole Downey. Catholic Central — Archbishop Williams: Ashley Dallaire. Arlington Catholic: Olivia Comeau, Nikki Doherty, Eileen Flynn, Sara Kanarkiewcz, Stephanie Kelley, Rachel Park, Danielle Sheehan, Emma Wiklund. Austin Prep: Stephanie Blais, Carolyn Casper, Alexie Losano, Nicole Poirier, Madison Shaw. Cardinal Spellman: Kristen Boyle, Kaitlin Hughes, Alese Schofield, Stephanie Tattrie. Lowell Catholic: Maggie Barros, Courtney Flynn, Bridget Keefe, Monica Pech, Amelia Relowicz. Matignon: Mellissa Collins, Emily Hontoria, Han Duong Khanh Le. Pope John: Sam Chen, Sarah Chen, Kamila Rodrigues, Kim Tran. St. Mary’s: Kelly Harrington. Catholic Conference — St. Joseph’s Prep: Binah St. Loth. Notre Dame (H): Grace Biciunas, Meghan Golden, Maggie Lewis, Meghan Flaherty. Ursuline: Sara Curtis, Jill Kamphaus, Ariana Lambros. Fontbonne: Colette O’Connor, Caroline O’Neill. Dual County — Acton-Boxborough: Amy Liu, Kayla Pieri. Bedford: Maya Biswas. Boston Latin: Olivia Lakes, Grace O’Brien, Jenny Peterlin, Boyi Wong. Concord-Carlisle: Meredith Block, Julia Cancio, Isabella Stone, Sarah Yang. Wayland: Izzy Essi. Westford: Natalie Bishop, Katie Hughes, Veronica Op, Claire Yu. Eastern Athletic — Bishop Feehan: Emma Cabral, Margaret Depont, Alexandria Sollecito. Bishop Stang: Charlotte Bednarz, Smita Rajan, Katie Vasconcelos. Coyle & Cassidy: Rebecca Santos, Grace Vaz. Somerset Berkley: Kelsey Gray, Bojana Roman. EIL — Beaver Country Day: Gabriela Marks, Catherine Wei, Hayley Zukerberg. Concord Academy: Issy Bush, Elly Veloria, Jenny Yung. Newton Country Day: Alessandra Saraceno, Grace Stillwell. Greater Boston — Cambridge: Ruby Booz, Amy DiPace, Amy Tung, Emily Vartikar. Everett: Ceceilla Tran. Latin Academy: Diandrea Galloway. Malden: Christine Le. Medford: Helen Lam, Sarah Lima. Somerville: Shan Shan Ou. Hockomock — Canton: Erika Nannery. Foxborough: Diana Prinos, Emma Prinos. Franklin: Anna Humphreys, Hannah Sweeney. Mansfield: Paulina Martin. Milford: Kelly Beyer. North Attleborough: Julia Mark, Alison McHugh, Alyssa Muise, Kelly O’Neill. Sharon: Michal Kondratiev, Pooja Puttigampala. Taunton: Jess Grey, Kim McNeil. ISL — Groton: Maddy Forbess. Milton Academy: Ilvey Bayturk, Maddie Dewire, Sasha Javanovic, Riley Kinney, Abigail Lebovitz, Semi Okolo, Te Palandjian. Nobles: Melanie Weinstein. St. George’s: Alexa Santry. St. Paul’s: Isabelle Turchetta. Thayer: Caroline Finnegan. Mayflower — Bishop Connolly: Maura Fennessey. Sacred Heart: Mia Cameilo, Mary Chapin, Haley Ferraro. West Bridgewater: Melissa LaRose, Caroline Previte. Westport: Kassidy Cestodio, Melinda Tripp, Emma Wilkinson. Merrimack Valley — Merrimack Valley: Andover: Samantha Camilo, Karena Yan, Courtney Nash, Paige Webster, Pooja Mukund. Sydney Ferry, Laurie-Maude Chenard. Notre Dame of Tyngsboro: Marykate McCarthy, Lydia Sweed. North Andover: Sammy Bologna. Haverhill: Christina Coakley. Tewksbury: Kylie Sedgwick. Middlesex (Freedom) — Burlington: Eleni Pesiridis, Anjalie Seereeram, Ada Wiggins. Melrose: Shannon Tarpey. Wakefield: Abby Chapman, Meghan Chapman, Grace Hurley. Watertown: Rebecca Hellman, Sarah Rahim, Jessica Russo. Middlesex (Liberty) — Belmont: Annie Hang, Amanda Jung. Lexington: Eugenia Fomitcheva, Michelle Katzelnik, Kavitha Pazhanisamy, Natalie Ramesh. Reading: Stephanie Cohen, Kathryn Shaffer, Mariella Waddington. Winchester: Izzy Bruno, Olivia Davis, Lena Pfeifenberger, Amanda Saich, Janie Weber. Northeastern — Marblehead: Hannah Cohen, Amanda Gilberg, Meaghan Hanratty, Kelly Mealey, Alice Yufa. Peabody: Rachael Gillis. Swampscott: Vivien Gere, Anna Raptunovich. Old Colony — Barnstable: Taya Berler, Michaela Cornwall, Gabrielle Riley, Katie Tynan. Bridgewater-Raynham: Leah Johnson. Dartmouth: Caroline Baglini, Hallie Cardoza, Courtlyn Long, Kelly McManus, Charlotte Rolston. South Coast — Martha’s Vineyard: Charlotte Potter, Sam Potter. South Shore — Carver: Casey Armanetti. Cohasset: Clara Baumgarten, Bri Crough, Emma Davis, Caroline Evans, Gabrielle Lemoine. East Bridgewater: Amy McKeever. Mashpee: Nica Zamira. Monomoy: Olivia Burke, Carly Donovan, Catherine Street. Norwell: Sarah Barcomb, Liza Basso, Paige Freeman, Olivia Rober. Tri-Valley — Ashland: Heidi Osterhout. Dover-Sherborn: Meredith Allen, Kelly Arani, Alex Blizard, MaryKate Forte. Hopkinton: Ameera Hammouda, Vanessa Prathab. Medfield: Caroline Beck, Kaitlyn Geraghty, Emily Marble. Norton: Olivia Christy. Westwood: Abby Groton, Joanne Nasr, Molly Walsh.